If you do not plan on majoring in music, but would like to continue playing bassoon at UT, you are welcome to audition for ensembles, and to take lessons for credit. Ensemble auditions take place during the first three days of class in August. The top players from the audition will be chosen for the rotation between the Symphony Orchestra, Opera Orchestra, New Music Ensemble, and Wind Ensemble which all rehearse Monday, Wednesday and Friday, 12:00 to 2:00. The Wind Symphony and Symphony Band rehearse Monday, Wednesday, Friday 2:00 to 4:00. You should prepare a solo of your choice (just 3 -4 minutes worth), and, if you would like to be considered for the rotation, the page of excerpts that will be posted on the Wind Ensemble site on August 1. Auditions for the University Orchestra (this group is comprised of mostly non-music majors) are separate. UO rehearses Tuesday and Thursday evenings. Sign-up for an audition time on the orchestra board in MBE. If you would like to take lessons, please arrange to play for me before the add/drop period ends. You may choose to visit in the spring or summer before school begins, or to make an appointment during the first week of class. Lessons are 2 credits (BSN 201). Registration for lessons is restricted, meaning, you need to get a form from the Student Office (MRH 3.836) and have me sign it approving your registration for bassoon lessons. 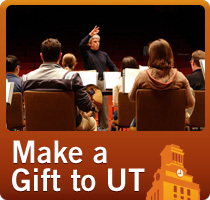 The UT School of Music does not have scholarships available for students who are majoring in something other than music. INSTRUMENTS: I encourage students to purchase their own instrument as soon as possible. If you do not yet have one when you enroll at UT, you may borrow one beginning at your orientation session. Contact me about arranging this (kwjensen@mail.utexas.edu).